AIG Malaysia vice president and chief financial officer Zawinah Ismail (left) and Lee introducing the intelligent mobile app that will be launched in 2019. KUCHING: AIG Malaysia yesterday marked its countdown towards its global centennial year with a special media briefing in Kuala Lumpur that celebrated its 66 years of safeguarding Malaysia while also identifying four key risk areas in 2019 amidst changing lifestyles and the advancement of technology. With its century-long risk expertise dating back to 1919, successful claims track record and financial strength, AIG Malaysia is well positioned to develop innovative solutions to tackle ever-changing risks in an increasingly disruptive world. Tackling road safety and high mortality rates head on should be the chief concern of any responsible insurer. In 2017, the Ministry of Transport reported 533,875 road accident cases nationwide and over 6,700 fatalities. 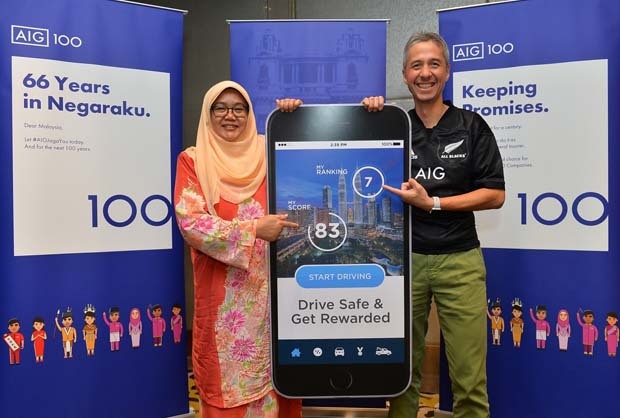 AIG will be introducing an intelligent mobile app in 2019 which utilises telematics to engage with Malaysians and inculcate safer driving habits via gamification. “Technology has allowed us to locate and manage real-time risks as we improve road safety standards for drivers and pedestrians alike. In line with our #AIGJagaYou promise, we will leverage data-driven insights from our mobile app, along with our claims experience, to cultivate better driving behaviours nationwide. “This effort is also in line with the liberalisation of motor insurance where premiums are now heavily influenced by driver risk profiles,” Lee said. As a leading Cyber insurer in Malaysia, AIG looks forward to the National Cyber Security Policy next year to safeguard the interests of individuals and businesses. With the advent of big data and the Internet of Things, demand for cyber-protection has exploded in recent years. In Greater China last year, AIG saw an 87 per cent increase in cyber submissions following the WannaCry cyberattack – more than double the 38 per cent increase in cyber submissions that AIG observed globally. There was also a 75 per cent increase in total cyber insurance claims from 2016 to 2017. AIG anticipates that local demand for cyber-protection against data breaches, identity theft, and malware will rise. With its CyberEdge insurance that combines expertise from ICT services and solutions provider Dimension Data, AIG has extensively qualified Cyber Breach Response and Claims teams at hand to support clients at their most vulnerable moments during cyber-related exposures – providing proactive risk services, comprehensive insurance coverage, and long-standing breach response and claims teams to help stay ahead of a disaster. AIG has also recognised the need to protect Malaysian Small and Medium Enterprises (SMEs) against the unforeseen risks beyond the obvious perils. According to AIG claims data, fire accounted for most SME claims in the last three years, and claims count and claim amount for fire losses also increased year-on-year in 2017. Despite the increase, only close to 15 per cent chose to purchase business interruption insurance. Similarly, only 15 per cent have purchased flood cover even though heavy downpour and unpredictable flooding has increased business risks significantly for SMEs – the Ministry of International Trade and Industry reported that the Kelantan floods in 2014 affected 13,000 SMEs, almost 40 per cent of SMEs in the state. More alarmingly, AIG has seen an increase in flood claims in areas previously unaffected by flash floods. During the Penang flood last year, nearly 2,000 victims were evacuated. AIG paid out an estimated RM2 million in claims, proactively responding to interim payments of up to RM20,000 to some of the most affected policyholders within four days of notification. AIG forecasts that the greatest risks SMEs will face in the next 12 months are from property and equipment damage. Last year alone, SMEs made claims in excess of RM8.1 million from AIG, and future claims are expected to persist at a higher range.